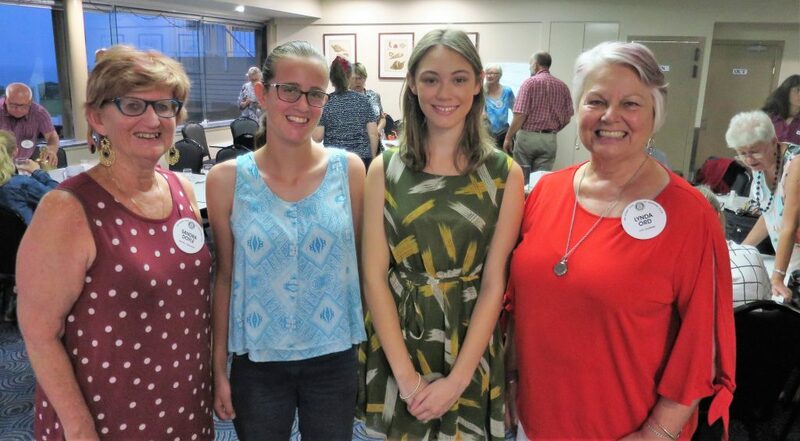 News – Narooma Rotary Club Inc.
President Rod presented Rotary Pride of Workmanship Awards on Thursday to Kimberley Clunne (IRT Dalmeny), front left, Jo Donkin (Dalmeny Long Day Child Care Centre), Jeannie Willoughby (Estia Health Dalmeny), Ria Manolias (Bodalla Dairy Shed), Karen Grindley (IRT Home Care); Melissa Burke (Tilba Real Dairy), back left, Ali Elmasri (Rapley’s Mid-town Quality Meats), Scott Curry (Will’s Water Worx). Will Farrell, back right, collected the award on behalf of Daniel Smith. Elise Dixson was also unable to be there. What a great night last week at the Pride of Workmanship presentations. Laurelle has the details below but I would like to congratulate Laurelle and her helpers for firstly attracting 10 awardees and secondly putting on a great night. Thanks also to Lynda Ord for a great job as MC. At the Board meeting last week, I am proud to report that we committed funds that achieved most of my fundraising targets for the year. These were $3,000 to each of our Tertiary Scholarship Fund, Rotary Health and The Foundation ($1,500) and Polio Plus ($1,500). These donations are a testament to everyone who has sold or bought raffle tickets, worked at the Markets and cooked or cleaned at other BBQs or participated in other events. We have one target to meet and that is $3,000 to local charities. I have one more raffle to run, a quilt made by my very clever wife which I will start after Easter. Monies raised will go towards the $3,000 local charities target. At the last Board meeting, we discussed options for filling the President vacancy for 2019-2020. 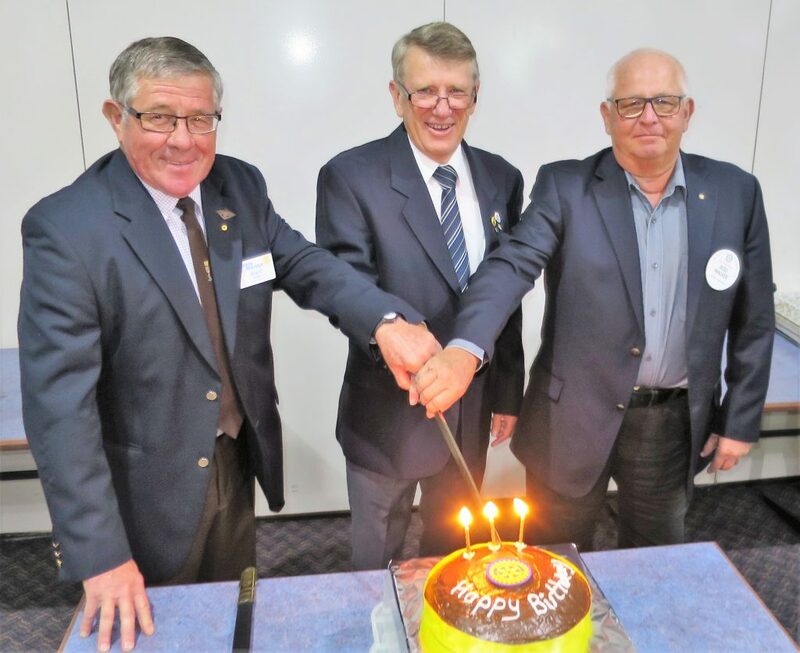 Our Assistant District Governor Allan Russell said he had seen another club rotate the presidency every three months so that a 12-month commitment was not required. So that would mean four presidents over the year. The Board agreed to this in principle and there was some interest from Board members to nominate. It was agreed that we should put the idea to members at our Club Assembly on 2 May. If agreed, we would also seek nominations as soon as possible. The Board is still happy to take an expression of interest for the full year up until 2 May so, if you can make the commitment for a full year, please contact me ASAP. See you Thursday. Happy Easter to those already away or unable to attend. 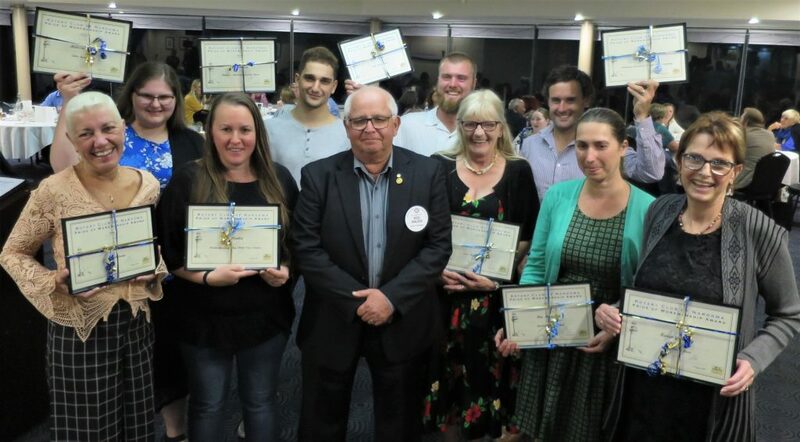 Last week, 10 local businesses recognised valued employees at our annual Pride of Workmanship Awards at a special dinner at Narooma Golf Club. Lynda Ord was our MC. The great strength of these awards is it’s not a competition, so everyone nominated is a winner. We couldn’t do these awards without the support of all the various businesses, some who come on board most years. 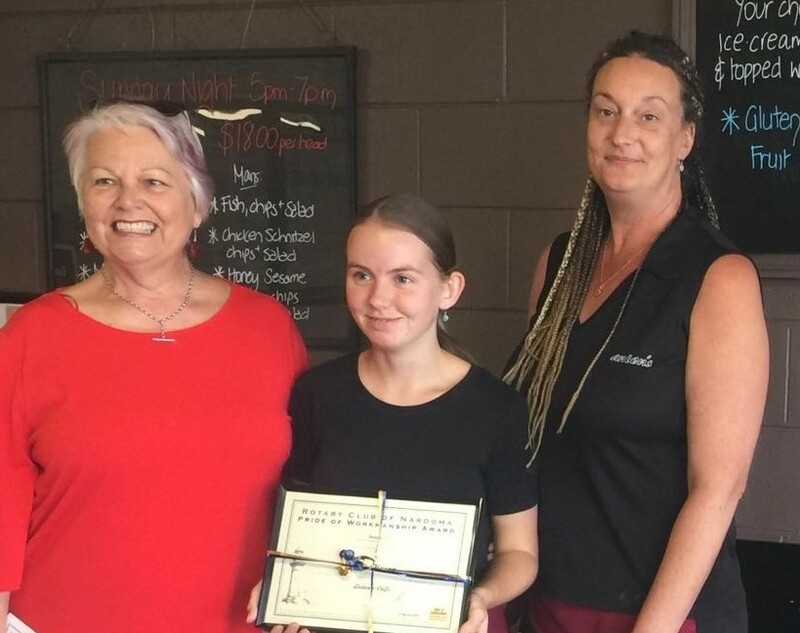 Lynda Ord presented Elise Dixson with her Pride of Workmanship Award at Anton’s Cafe on Saturday with one of her sponsors Nanette Parker. The beneficiary of our joint fund raising with Batemans Bay and Moruya Rotary clubs and the Moruya Jockey Club at the Christmas Races will be Yumaro and Eurobodalla Meals on Wheels. The aim will be to raise at least $15,000 towards a people mover bus for use by both organisations. Off to Canberra again this week – President in absentia again. Laurelle will be in the chair. I hope though to be around for the rest of April’s meeting. I thought last week’s meeting had a really good vibe with a wonderful number of guests, mainly thanks to Ange’s efforts. Dr Denis Muller was certainly an interesting guest speaker. 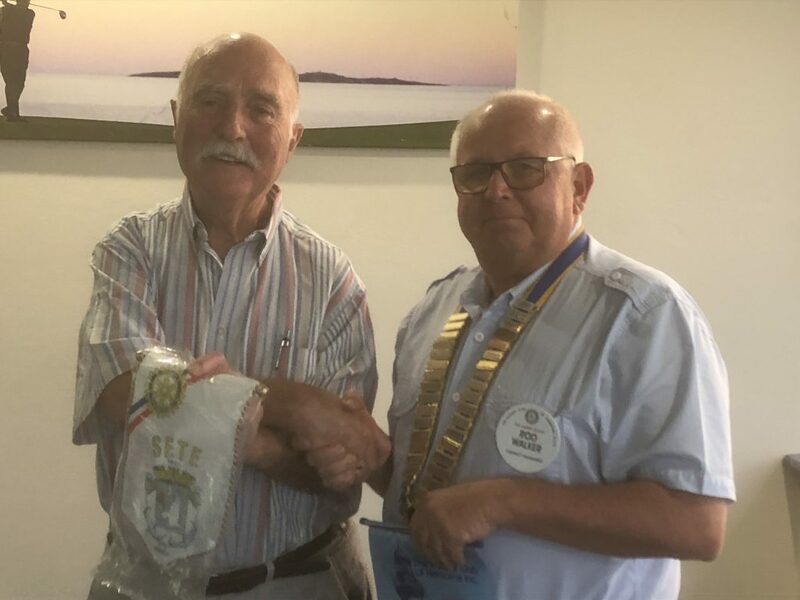 Colin Lyle from the Rotary Club of Sete presents President Rod with a banner. We also had a visiting Rotarian, Colin Lyle from the Rotary Club of Sète. Sète is a major port in the southeast French region of Occitanie. It’s bordered by the Étang de Thau, a biodiverse saltwater lagoon and across a narrow isthmus, Sète’s Mediterranean coast which is lined with sandy beaches. The top of Mont St Clair offers views of the city, known as “Venice of the Languedoc” for its canal network. The Musée Paul Valéry has displays on the history of Sète, plus an art collection. We have plenty of action coming up. Last Thursday we had 32 members and guests at our meeting. We were delighted to have Colin Lyle with us from the Rotary Club of Sete as well as our guest speaker, Dr Denis Muller. Colin Lyle is in Australia to visit family and decided that Narooma was a good place to stop over on his way to Melbourne. 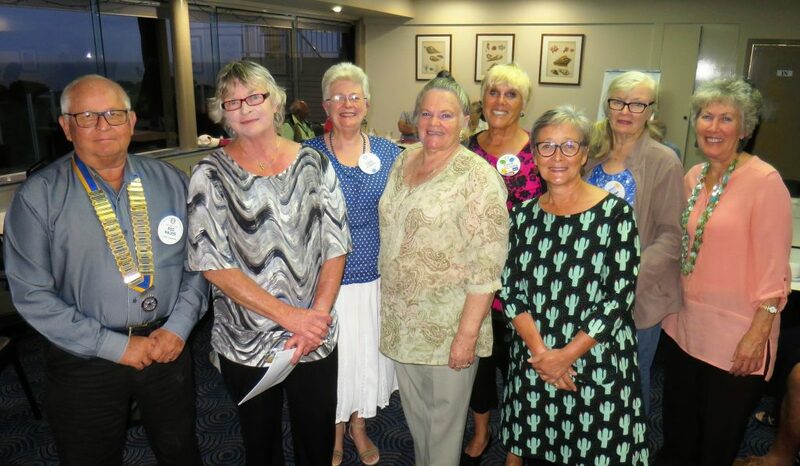 Like Narooma Rotary, the Rotary Club of Sete is finding it difficult to attract new members, the average age of members is over 70. The Club has two dinner meetings as well as two informal meetings a month. Denis Muller spoke on Fake news and the decline in credibility of the media. 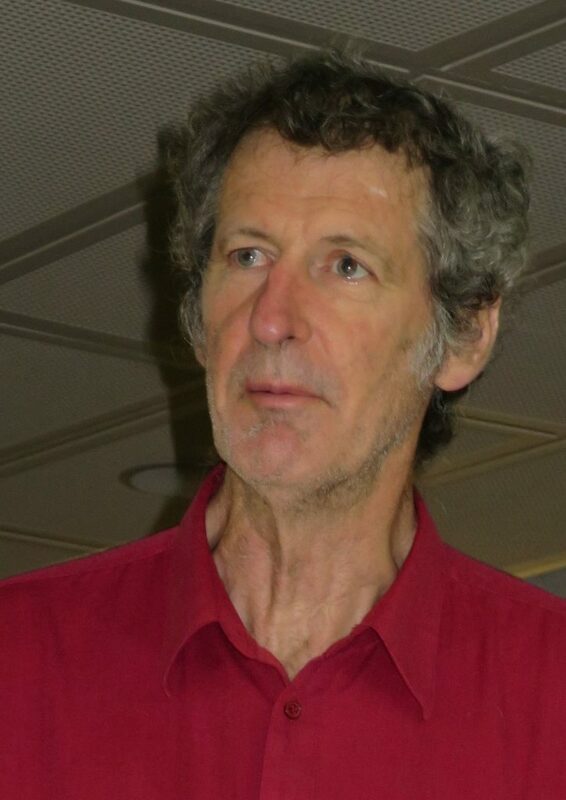 Denis is a Senior Research Fellow at the Centre for Advancing Journalism at the University of Melbourne. Denis believes that the main reasons for the loss of public trust in the media include political partisanship, the perverse effects of competition, the culture of competitiveness and individualism, and the lack of accountability. Mal Gray tanks Denis Muller following his presentation at Thursday nights meeting. Denis believes that although ‘Fake News’ is not new (he provided numerous examples of fake news from well before the Internet and social media) the rise of the Internet makes it all the more prevalent with many journalists, social media companies and media organisations failing to check the facts before a story is published. This Thursday, Sandra, Ange and Geoff will tell us all about their experiences at this year’s Rotary Youth Driver Awareness (RYDA). They will have accompanied Narooma High’s Year 11 students around the various stops on Tuesday. RYDA targets pre-learner drivers from Eurobodalla Shire’s five high-schools. 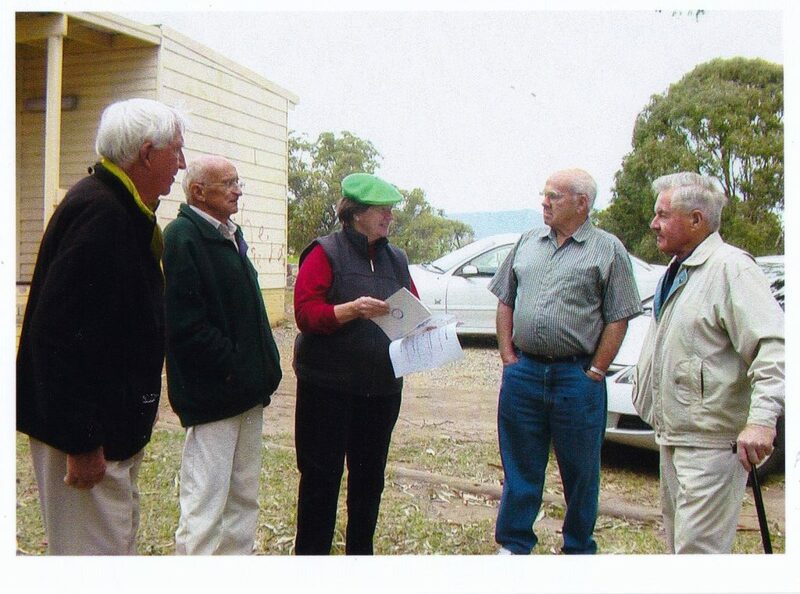 It is run by Batemans Bay Rotary in conjunction with Moruya and Narooma Clubs. Our Club pays for the bus to get Narooma students there. Incoming District Governor, Peter Ford has advised that the District Changeover is on Sunday 30 June 2019 at Gold Creek Station, Victoria Street, HALL ACT. 12 noon for 12.30pm start. Details re cost and registration still to come. Next Thursday is the club’s annual Pride of Workmanship Awards, one of our most prestigious nights of the year. It will be wonderful to have a few of our partners along. We look like making about eight awards. Each person receiving an award has been nominated by their employer because of their outstanding qualities in terms of approach, attitude, dedication and commitment to their job. This Rotary program aims to encourage pride of workmanship in the community by publicly recognising the value of a pride in personal performance in the workplace, hence the scheme’s motto ‘Do it once, do it well.’ Another way of saying that might be, ‘Good enough is just not good enough’. It’s normal time – 6 for 6.30pm. Cost is $35 for a two-course meal (choice of two dishes each course; please let Bob know numbers and any special dietary requirements). Hope to see you there. Every time you clean something, you make something else dirty. Hello. My Rotary contribution this week was limited to helping out towards the end of the Market. Unfortunately rain dampened the enthusiasm of many stallholders and when I arrived there were only about one third left and the BBQ boys were having a chat. Thanks to all who helped out. 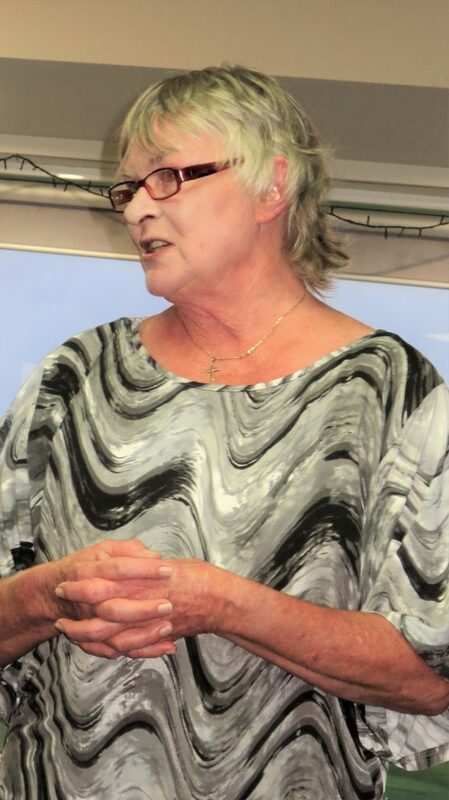 Bob and Therese Aston head oversees mid April so I am looking for some assistance with clearing the mailbox and taking and collating Board minutes in April, May and June. I will also need help to mark out NATA Oval for the markets in April, May and June If you can help let me know ASAP. A more serious and now pressing matter is that regretfully David McInnes has withdrawn from being President Elect and the Presidency for 2019-20. If anyone is prepared to step into this breach contact me urgently as there are two meetings approaching were your attendance would be beneficial. I would like to go to the next Board meeting with a solution to this problem but can’t unless someone steps up to help ensure the future of the Club. Dennis worked as a newspaper journalist for 27 years on The Sydney Morning Herald and The Age. Since 1995 has worked as an independent social and policy research consultant , taught media and communications management and ethics and media law at the University of Melbourne, been a weekly guest on ABC Radio Victoria in ‘Behind the Media’, and wrote Journalism Ethics for the Digital Age. Sounds particularly timely… Don’t forget to invite your friends and family and let Bob Aston know by Tuesday if you are bringing any extras. What a fascinating talk Geoff Robin gave last week about The Australian Constitution; his passion for the subject shone through. Most of us also realised how little we know about our Constitution and how much we take for granted. Geoff is a former journalist (Canberra, Melbourne), Federal public servant, and former advocate for the Australian Local Government Association, and much more. He outlined why he believes the Constitution needs reform, drawing our attention too to many sections now redundant. Interesting there are over 50 references to the Queen. He also highlighted how difficult it is to make any reforms. What was also interesting was hearing some of the ‘back story’ to the drawing up of our Constitution. Most of us have heard of Henry Parkes and Edmund Barton in relation to the Constitution, but in fact the principal author of the Constitution was Tasmanian Andrew Inglis Clark (1848 –1907) who was also an engineer, barrister, politician, electoral reformer and jurist. Ill health plus other factors took him out of the picture in the late 1890s. Geoff said in one of several reviews of the draft Constitution, his colleagues removed what is referred to as ‘Clark’s clause’ which, “as well as providing for the concept of an Australian citizenship, embraced the most fundamental of individual rights, the protection of life, liberty and property and equality before the law”. The Australian Constitution Act was passed by the British Parliament 9 July 1900. Who would have thought such a potentially dry subject could be so interesting. A meeting of almost 400 people in Bega last week unanimously voted for 100% renewable energy for the Bega Valley by 2030. The vote, initiated by local climate change action group Clean Energy for Eternity (CEFE), followed a similarly unanimous vote and public meeting in Tathra last month that was attended by Frank. The talk was not just on solar, although mention was made of the potential benefits of a community-owned solar farm. Wind, the rapidly growing and developing field of lithium-ion batteries, which have historically been the most expensive part of any solar system, were all mentioned. Also mentioned was the potential of anaerobic digesters to capture gases from organic waste and create power. Sandra, Geoff and Ange will accompany Narooma High students at this year’s Rotary Youth Driver Awareness (RYDA) for Year 11 students next Tuesday 2 April. This is the second day of the program which targets pre-learner drivers from Eurobodalla Shire’s five high-schools. 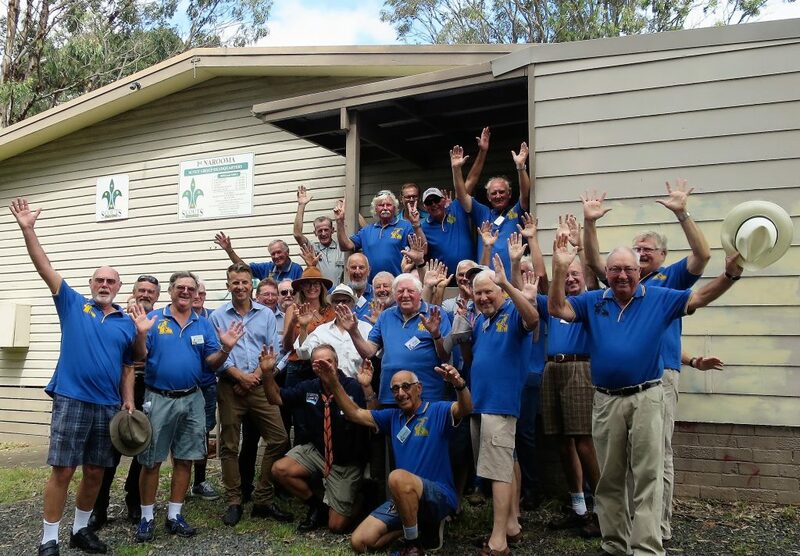 It is run by Batemans Bay Rotary in conjunction with Moruya and Narooma Clubs. Our Club pays for the bus to get Narooma students there. Rotary has worked for decades to provide people with clean water by digging wells, laying pipes, providing filters, and installing sinks and toilets. But the biggest challenge has come after the hardware is installed. Too often, projects succeeded at first but eventually failed. To read more about how Rotary tackles this problem click here. The Band of the Royal Military College in concert. This Thursday many of us are attending the Band of the Royal Military College concert at the Golf Club. For those of you not coming, this is what you are missing. Often referred to as RMC Band or the Duntroon Band, it is based in Canberra. 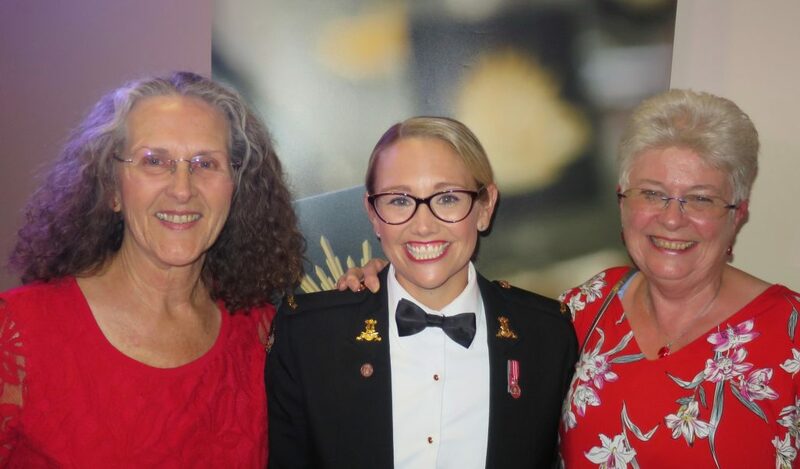 Its role for the Army and the Australian Defence Force is predominantly ceremonial in support of Vice-Regal and government agencies, Defence Headquarters and the Royal Military College, but off the parade ground it performs as a concert band and has several smaller ensembles as well. These ensembles include a concert band, marching band, stage band, woodwind quintet, brass quintet, jazz ensemble, rock band, Dixie band (known as the Steamboat Stompers), saxophone quartet, clarinet quartet, and woodwind trio. 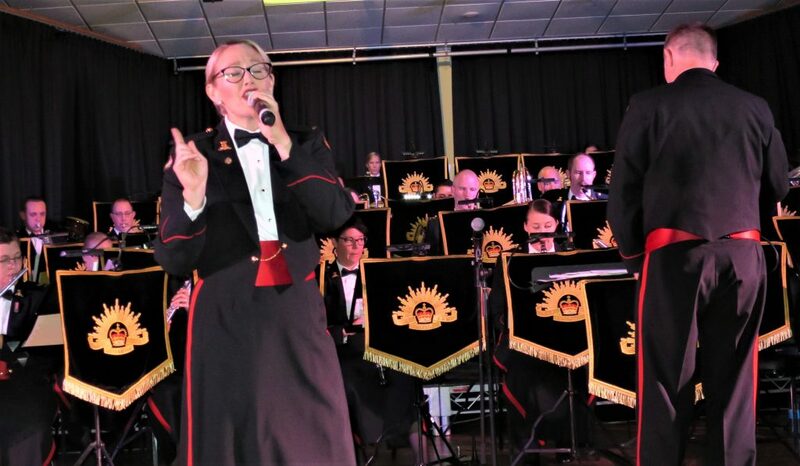 This versatility enables the band to cover all ceremonial tasking in the ACT and to perform a regional role engaging with the community, such as with this concert tour. The band has been deployed in many areas – support to OP BELISI II – Peace Monitoring Group – Bougainville, OP WARDEN – International Force East Timor (INTERFET), and OP ANODE – Regional Assistance Mission to the Solomon Islands. International engagements have included representing Australia in Paris for the 50th Anniversary of Armistice Day in 1968, ceremonial activities in London commemorating the Centenary of Federation in 2000 and ceremonial duties at Gallipoli on Anzac Day 2003. The band is also a respected participant in the arts life of the wider community in Canberra. In addition to concerts at many of Canberra’s national institutions, the band is well known for its regular Music at Midday series held at the Canberra Theatre which raises funds for local charities. Rotary Youth Program of Enrichment (RYPEN) is a three day personal development camp, sponsored by Rotary Clubs, for boys and girls 14-17 years old. It targets those who show qualities of decency, courage, persistence, sincerity and application that deserve further development. They don’t have to be school leaders or top of the class. The next RYPEN Camp is 17-19 May at Old Mogo Town. We need your help to find students to participate in this extremely worthwhile program. 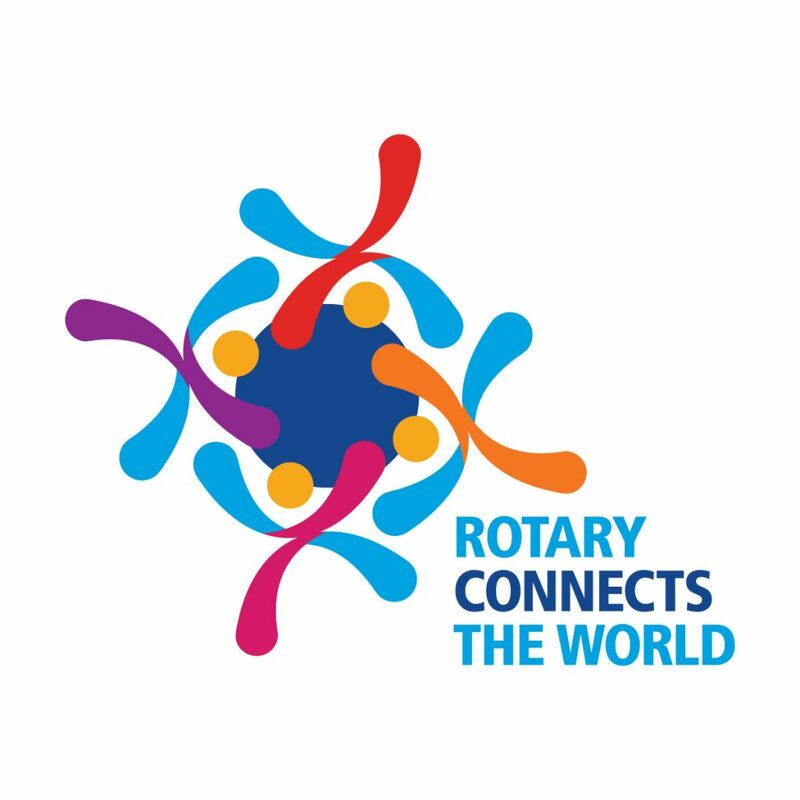 There are 64 places to fill across our Rotary District and we hope for an even mix of boys and girls. RYPEN aims for the average student and not the outstanding few. If you know anyone who might be interested, please let us know ASAP. I hope to see you all at our meeting on 21 March. Our meeting this Thursday has been replaced by The Band of the Royal Military College Duntroon concert, also at the Golf Club. Over 20 Rotarians and friends are going. Starts at 6pm. Two-course dinner and concert. Over 20 of our Rotarians and friends are going. Charmaine’s daughter Liz will be starring. $10 from each ticket is going to the local Rural Fire Service. Bob Aston kept us entertained with some interesting Maths puzzles… all good fun although few got the correct answers. Bob then informed us they were aimed at Grade 5s…. groan. ShelterBoxes help families stay living as a family unit after they lose their home in a natural or man-made disaster. Countries affected included Antigua/Barbuda in the West Indies, British Virgin Islands, Chad, Cameroon, Dominican Republic, Ethiopia, Indonesia, Iraq, Kenya, Nigeria, the Philippines, Syria, Somaliland and Bangladesh. 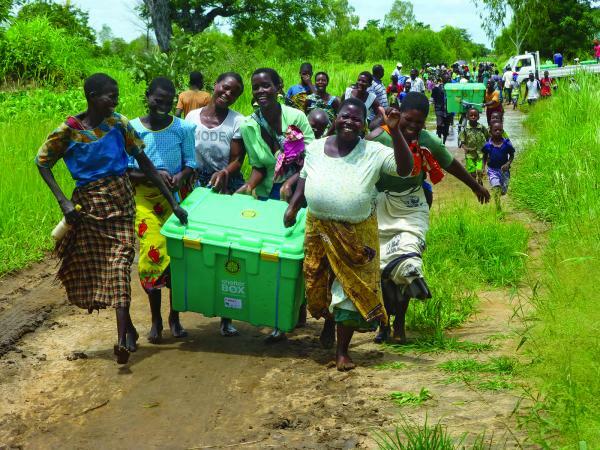 In 2018, Rotary International and ShelterBox provided support to 30,000 families by providing them with emergency shelter and other household items including tents, blankets, mosquito nets, water carriers and filters, and basic tools. A further 12,000 families were provided with essential household items. Rotarians around the world spent 1,120 days helping in many of these areas. This year’s Rotary Youth Driver Awareness (RYDA) for Year 11 students will be held at Moruya Jockey Club Monday 1st and Tuesday 2nd April. Narooma High students are going on the Tuesday and Sandra, Geoff and Ange will be helping. 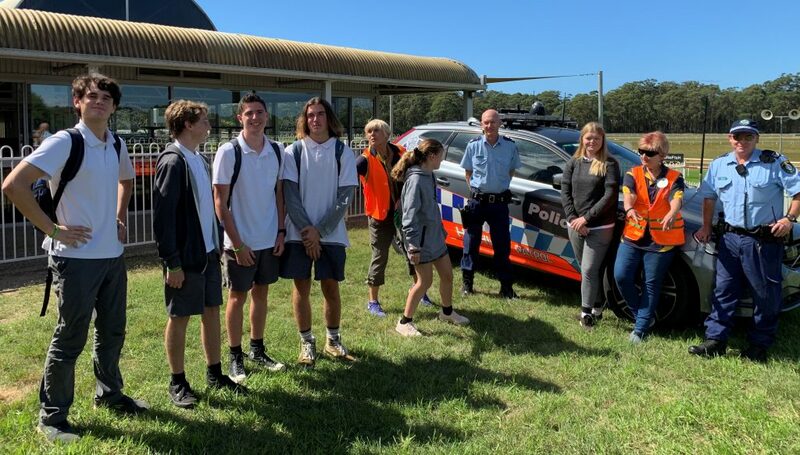 This programme targets pre-learner drivers from Eurobodalla Shire’s five high-schools and is run by Batemans Bay Rotary in conjunction with Moruya and Narooma Clubs. The RYDA programme is written and resourced by Road Safety Education (RSE) Ltd (www.rse.org.au) and is presented to students from 600 schools across Australia. The theme of the day is ‘My Life, My Choices’ and covers a broad range of topics including hazard perception, fatigue, stopping distances, vehicle safety and the opportunity to listen to and speak with a crash survivor. 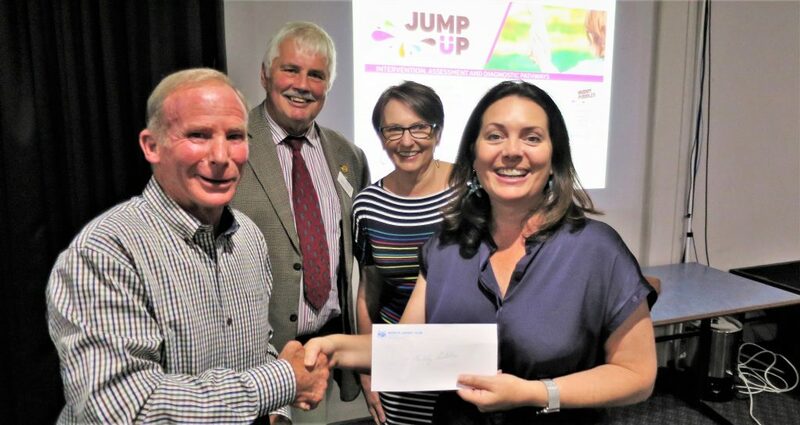 RYDA is a significant youth project for our clubs and particularly involves Batemans Bay and Moruya members in organising the days and in catering, as well as Council, Moruya Jockey Club and the Coastal Auto Group. Our very own Geoff Robin will talk about The Australian Constitution. Geoff is a former journalist (Canberra, Melbourne), Federal public servant, and advocate for Australian Local Government Association, and much more. He is passionate about the democratic process and therefore our Constitution which he believes needs urgent reform to safeguard our Parliamentary democracy. Should be interesting…. Regrettably I will not be with you again this week due to work commitments, this time with the Australian Security Directorate which is the organisation charged with protecting our online data. They were recently in the media concerning a cyber hacking incident involving Parliamentary emails. It has been an active Rotary week. 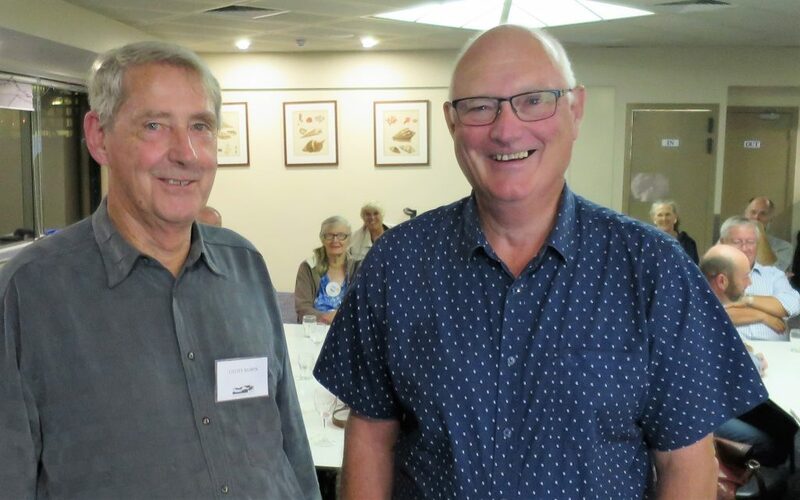 On Saturday, President Elect David and I went to a Rotary Foundation seminar in Ulladulla. 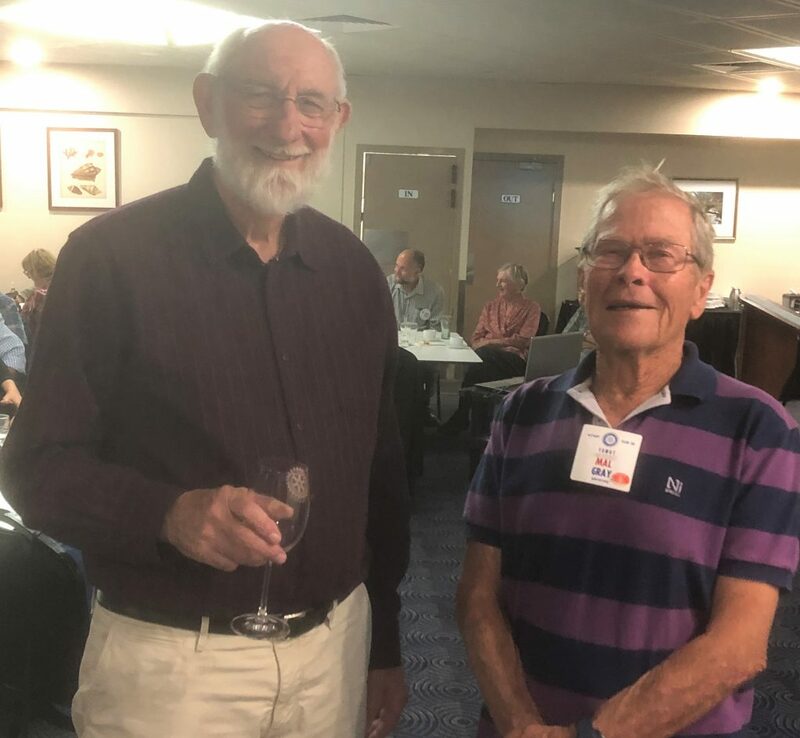 I have been to a couple before as attendance is a condition for applying for a District Grant but it was good exposure for David as well as the opportunity to network with other Rotary Clubs. The Foundation is of course Rotary’s charity. At the 1917 RI convention, outgoing Rotary president Arch Klumph proposed setting up an endowment “for the purpose of doing good in the world.” That one idea, and an initial contribution of $26.50, set in motion a powerful force that has transformed millions of lives around the globe. If you would like to learn more about the Foundation click here. You might also find this video worthwhile. On Sunday some of our members participated in Clean Up Australia Day. Our site was Lewis’ Island – Mill Bay- boardwalk- to the wetlands. I was pleasantly surprised with how little rubbish there was. I found no cans, one bottle and lots of small pieces of plastic that can be deadly to marine life. More elsewhere in the Beacon, but thanks to Laurelle for organising the project. 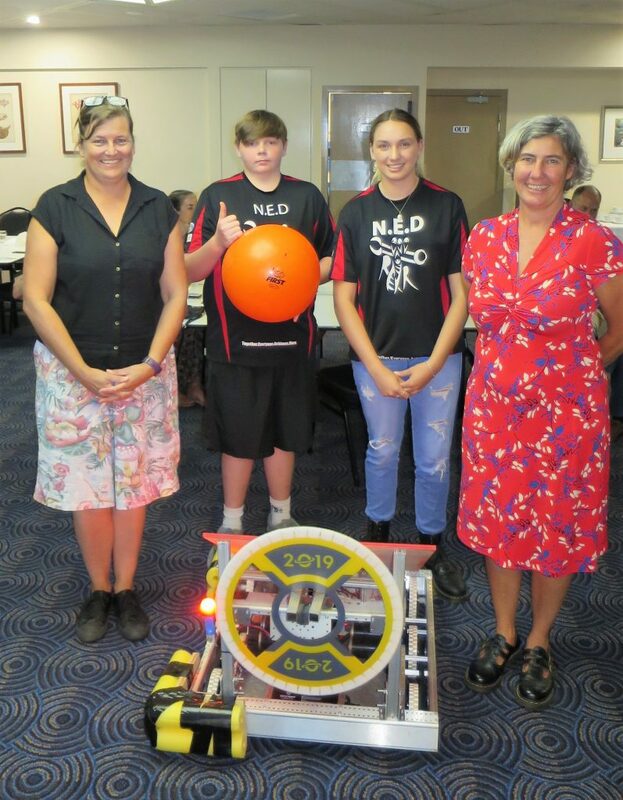 What a fascinating and inspiring meeting last week with Narooma High Science teacher and guest speaker Gayle Allison, fellow Science teacher Christina Potts, and two of the School’s robotics team Robo Rebels Abbey Dawson (Yr 10), Andrew Baker (Yr 9). Bob Aston in introducing them stressed the importance of encouraging young people into science to create the technology leaders of tomorrow. 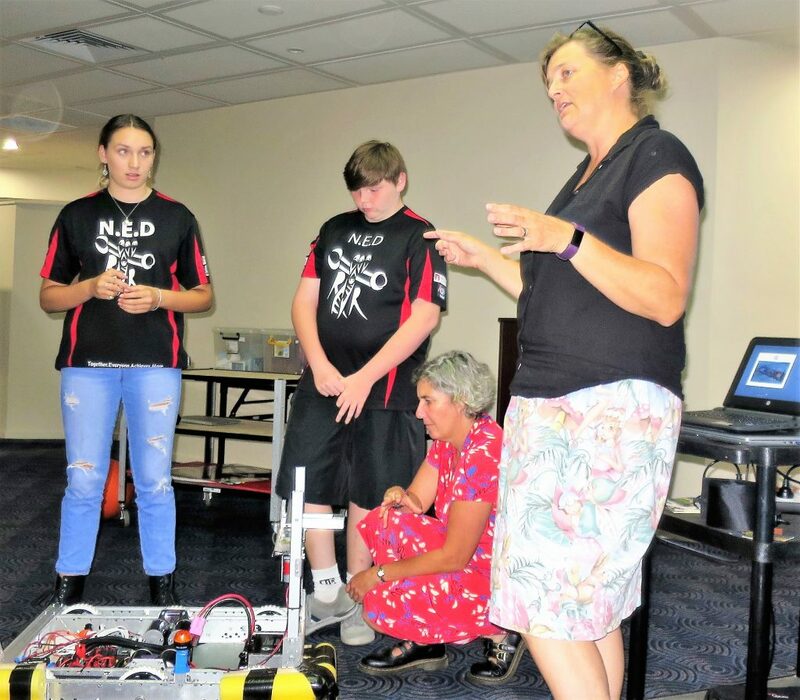 Gayle said the school’s robotics team started about fours ago as an extra-curricular activity and since then the team has increased its level of sophistication. Robotics is now an elective at the school and includes coding and electronics. Each year the team enters competitions, seem to be mostly if not all associated with the Lego League Trust; their first this year is the South Pacific Regional competition at Sydney’s Olympic Park 15-17 March with a Deep Space theme. The team is already there fine tuning for the competition which involves 10 matches over two days. Narooma High Science teacher and guest speaker Gayle Allison, Robo Rebels Andrew Baker and Abbey Dawson, and fewllow Science teacher Christina Potts, with Buzz in foreground. Gayle said it is a massive achievement just to get the team there. The kit alone costs $7,000. Robo Rebels fundraise by running robotics workshops for the area’s young people (over 1,000 have done robotics workshops since 2015) plus run the occasional sausage sizzles at the school. Narooma Quota and Club Narooma provide ongoing financial support for the team; perhaps a good project too for our Club to support. The next competition will be in July. Our other guests last week were Lynne and Jack Jefferis of Temora Rotary Club, local ice-cream van man Julian Domaracki and Becky Doyle. 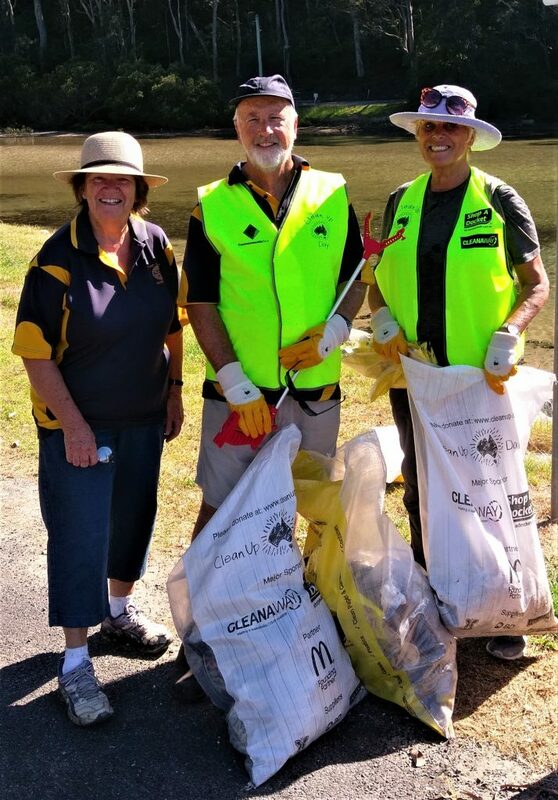 Laurelle , Mike and Ang were half of the Narooma Rotary team that picked up rubbish along the northern foreshore of Wagonga Inlet on Sunday. On Sunday, Ang, Mike, Rod, Gordon, Steve and Laurelle picked up rubbish along the North Narooma foreshore of Wagonga Inlet from Lewis Island to the Apex Park boat ramp and along to the Bar Beach wetland. One is the ongoing and maybe increasing efforts by many in our community to keep this area rubbish-free – many people, and some in particular, regularly pick up along the way as they walk and enjoy that area. The other is the cash for returns of cans and bottles. Whatever it is, it is working. A great and ongoing effort by our community to look after the wonderful environment in which we live. Unfortunately Rod and Gordon shot through before we could get a photo. Remember next week’s meeting has been replaced by the Duntroon Band Concert. Over 20 Rotarians and friends are going to this event. It should be a great concert and featuring Charmaine’s daughter Liz.